Providing our customers with exceptional service and offering the highest quality custom designed and installed garage doors from the ground up is our passion! We at Superior Overhead Door are dedicated to providing the highest quality designs and installation while maintaining the Superior prices. We (Garage door contractors Tulsa) thrive on providing courteous and professional service; we put an emphasis on having a highly trained staff. We do not use sub-contractors which allows us to make sure our garage door technicians are consistently updated and trained in the latest offerings and techniques in the industry. Simply put... our focus is delivering the best and ensuring our customers get the best value possible. We are committed to being the very best partner that our customers can select to work with to further beautifying their home with a top quality garage door. Further we are determined to maintaining service and quality as our primary product. In everything we do, we are committed to serving our customer with integrity and honesty including standing behind our products safety and performance. 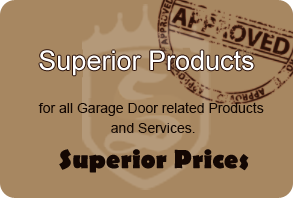 Superior Overhead Door has years of experience and works with numerous builders to provide the best garage doors. We have designed and installed countless hand crafted garage doors with attractive hardware that compliments the door. We are experts at working through a design that perfectly suits your home. The crew at Superior Overhead Door have over 100 years combined experience designing, installing and servicing garage doors, custom hardware and accessories for garage doors. Our goal is to attract talented, creative and energetic individuals as employees. We empower our employees so that they can meet their goals.